Cancer is the life threatening disease, known for its uncontrolled growth and fast spreading power in the body. It affects the surrounding tissues and the organs. When, over a period of time, toxins collect at the site of a particular organ, it results in over growth in its surrounding cells. The groups of cells accumulate and produce swelling at the site. Nearby cells and tissues are also affected if the toxins are not removed as the diseased cells are circulated to other parts of the body through the blood stream. Due to some mutations in the DNA, the damage occurs to the genes which results in cell division. The Ayurveda is the science which believe in the in-depth and holistic approach of treatment. It provide support to the treatment of cancer. 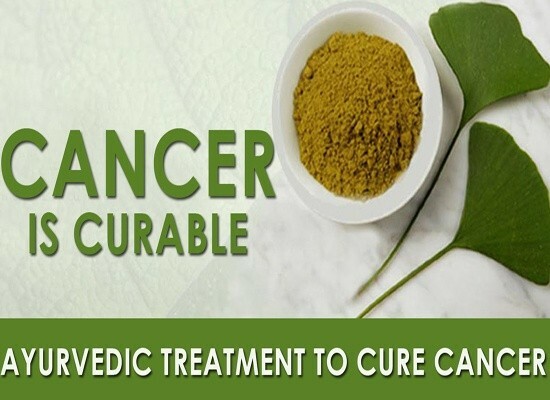 Cancer treatment in Ayurveda is dependent upon the entire system of the body not only the area of malignancy, as the whole body is needed to be in healthy condition, otherwise the disease can return to infect the body again. The compound Curcumin is isolated from the turmeric. It is well known compound used in the cancer treatment and prevention. It is observed to be beneficial in all types of cancers. It helps in stopping enzyme COX-2 which is known for results inflammation, which is precursor to cancer. It also inhibit the vascular epithelial growth factors, which results in the stopping the blood supply to the cancerous area which results in restriction in the growth. It shows the inhibition effect to metastases and have tendency to kill B lymphoma cells (cancerous) and helps in preventing the regrowth of the cancer stem cells. Because of these many uses of Curcumin in cancer, it is now recommended by many doctors for the treatment of cancer as a supportive medicine. Tulsi is a “holy herb”, used in treatment of many diseases. It is known for its anti-allergic and anti-inflammatory properties. It is very useful in providing relief during the cancer disease, by helping in restricting the cancer to a certain point and also prevents inflammation. The cycloxygenase and lipoxygenase pathways are inhibited by guggul, due to which no inflammation takes place. Which is helpful in cancer prevention. It also provide relief in pain, swelling, aches and fever. Ashwagandha is known as stress buster, which is helpful in improving sleep, relieving anxiety and prevent the condition of inflammation. As the inflammation is related to cancer, it is helpful to the preventing cancer. It stimulates immune responses and effective against all types of cancers. Garlic is proved anti-cancerous remedy, used in healing colon and brain cancer. It has been used to treat cancer for ages, as raw garlic or even garlic juices or soups. It is to treat cancer for ages. It is known for killing brain cancer cells, without any harm to the healthy cells. The regular use of onions and broccoli can also prevent cancer. Used for the treatment of colon cancer and helps in stimulating the immune system. Due to which it is helpful remedy in prevention of cancer. The green tea is useful in the healing and preventing of colon and other cancers. It inhibits the formation of cancerous cells. The compound named catechin is a polyphenol, capable of killing cancerous cells, without harming healthy cells. The use of aloe vera and apple cider vinegar are known anti-inflammatory agents and in a synergistic way helps in cleansing the colon, removing toxins, accumulated in the intestine. The removal of these toxins is the important step because they can become a possible reason of cancer in later stages. Some other herbs namely Kapoor (Cinnamomum camphora), vacha (Acorus calamus), Mushak (Cryprus rotundus), Kirattika (Swertia chiretta) and Devdaru (Cedrus deodara) are also responsible for the cancer healing and prevention. There are lots of herbal formulations present in the market, helping people in recovering and preventing from the various cancers. Some are Chanderprabha vati, Kachnaar Guggul Tablets, Ashwagandha capsules, Chanderprabha vati, Curcumin Capsules, Tulsi Capsules and Guggul Capsules. Cancer treatment in Ayurveda is getting popular day by day. Also there are lots of people taking benefit of this treatment. It is acting as a supportive treatment in cancer, without side-effects and 100% herbal. The Ayurvedic treatment is the best treatment for almost all type of cancers.